What does it mean to see and experience architecture live? 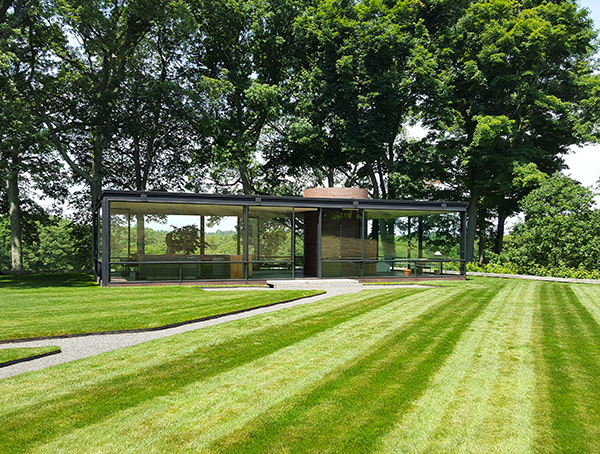 Last summer, we had an opportunity to visit two houses in the United States that are arguably amongst the ten most important houses of 20th century architecture: Wright’s masterpiece “Falling Water”, and Johnson’s own house called “Glass House”. Each of the two houses is unique and represents a milestone in the history of architecture: two houses without a precedent. With the dynamically conceived architecture of the charismatic F. L. Wright, the house on the waterfalls, which is somewhat older, changed the notion of the time about a typical weekend house in a forest. Wright positioned the house above the waterfall, but did not turn it towards the waterfall as the client had wanted. He thus created a story about architecture being connected with nature, a story that even today, almost 80 years on, is very convincing. The story of architect Philip Johnson is also highly compelling. He chose New Canaan, only an hour’s drive from New York, as the location for his weekend house. There he gradually purchased plots and erected fascinating experimental buildings on the estate in different time periods, right through to his advanced age in his nineties. In 1949, he built two houses simultaneously: one glass house and one brick house. Transparent and closed. Extroverted and introverted. His glass house can thus be understood as part of a full-empty pair, and only then does it become clear to us how he could have made a glass house that is indeed fully glazed, open and connected with nature. There are no more boundaries between the exterior and the interior; nature becomes architecture and vice versa. This is the wish of many an architect, but few are offered an opportunity to realise it or succeed in doing so. It is true that the glass house is located in the middle of the estate, removed from the road and disturbing views from outside, and therefore does not have any interior curtains or blinds, with shade being provided by the surrounding trees. In reality, both stories – the one about the house on the waterfalls and the one about the glass house – are much more complex and perhaps deserve a substantially more comprehensive presentation… but when you see and experience them in person, albeit with the eyes of a visitor on a guided tour (it would certainly be different if one had an opportunity to actually live in the house), it is clear that no matter how good an animation and a virtual stroll through a house may be, they cannot replace the experience of live architecture, in person. A house still needs to be felt and experienced with one’s own senses; only then can we gain a true impression of it. There is something else that I am always trying to convey to my students: if at all possible, return to certain places and works of architecture throughout your lives. You will perceive how places and houses change with the growth and development of the individual’s architectural personality. Let us focus on the content of the present issue. This time, we highlight the interesting, albeit perhaps somewhat less known, topic of architect Paul Edward Geller, who seized an opportunity to design a tourist resort in the Dolomites in Italy, made up of holiday cottages, apartments, a church complex and a small hotel. Each of the architectural works is fascinating in both its concept and its placement in space, but we found the hotel building particularly interesting and so present it in more detail. The central part of the magazine, dedicated to the Piran Days of Architecture in 2014, is represented by an interview with the recipients of the Piranesi Award. Amongst Hungarian vineyards in the Eger region, architects Peter Gereben and Marian Balazs designed a small contemporary tourist complex in harmony with the landscape and with the traditional architecture of the local environment. Small houses with gable roofs make up a miniature resort where a person would love to view and experience architecture live while sipping a glass of good wine from the vineyard. This provides additional proof that experiencing architecture live is an imperative that gives you wings, like in the commercial for a well-known energy drink.